Whether you are installing oversized tires for that next great off road adventure, or simply looking to add a few more inches of clearance, Pro Comp’s 3.5” lift kit with Pro Runner monotube shocks provides impressive suspension performance while maintaining vehicle safety. Pro Comp has repeatedly passed extensive safety and durability tests to become a well-known and trusted brand within the world of specialized parts upgrades, and this kit is no exception. It has been evaluated by the Federal Motor Vehicle Safety Standards and has successfully proven itself in the FMVSS Electronic Stability Control System test. 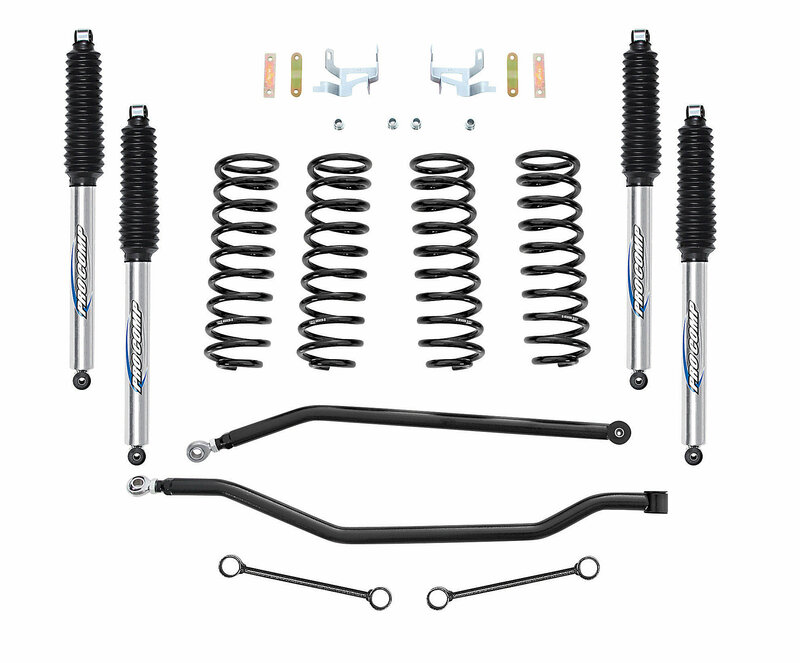 Pro Comp’s 3.5” Lift Kit with Pro Runner monotube shocks includes everything you need to comfortable mount 35-inch tires, including front and rear adjustable chromoly trac bars with heim joints, shocks, finely tuned coil springs and brake lines with brackets, as well as all essential installation hardware. All so you can spend less time installing and fine-tuning the parts, and more time enjoying the kit. By choosing Pro Comp for your vehicle upgrades, you’re not only getting the quality parts you want, but you can also rest assured that each piece is engineered to meet the highest standards of safety, durability and reliability. Quality Materials: Designed to last for years of both on- and off-road driving, each piece is made with attention to detail out of high-quality materials. Complete Kit: Each piece is built to compliment the rest of the kit, so you can spend less time fine-tuning the coils and shocks and more time enjoying your ride. Attention to Detail: The best suspension systems hold up to even the toughest off-road driving without snapping or decreasing precision and maneuverability. This kit has been tested and proved, so it won’t let you down when you need it most. High Performance: The Pro Comp 3.5" lift with Pro Runner shocks not only has eye-catching style, but it also keeps your ride quality factory smooth and your handling precise despite that extra ride height.